The Tony® Award Winning musical, MILLION DOLLAR QUARTET is set on December 4, 1956, when an extraordinary twist of fate brought Johnny Cash, Jerry Lee Lewis, Carl Perkins and Elvis Presley together at Sun Records in Memphis for what would be one of the greatest jam sessions ever. 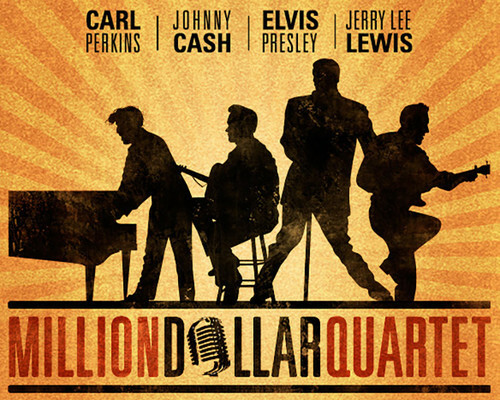 Million Dollar Quartet brings that legendary December night to life with an irresistible tale of broken promises, secrets, betrayal and celebrations that is both poignant and funny. Relive the era with the smash-hit sensation featuring an incredible score of rock ‘n’ roll, gospel, R&B and country hits, performed live onstage by world-class actors and musicians. Showcased hit songs include: “Blue Suede Shoes,” “Fever,” “Walk the Line,” “Sixteen Tons,” “Who Do You Love?,” “Great Balls of Fire,” “Folsom Prison Blues,” “Whole Lotta Shakin’ Goin’ On,” “Hound Dog,” and more.